Inconsistent materialsTo avoid objectionable color issues, it's important to maintain consistency throughout the project, especially in mix proportioning. Deliveries of mixes that are drastically different from batch to batch make it difficult to achieve a uniform concrete surface color. It is the responsibility of your ready-mix producer to deliver a consistent concrete mix. But that's more complex than it sounds since concrete is made up of a number of ingredients with their own inherent variability. Cement, supplementary cementitious materials, sand, stone, water, admixtures, and possibly fibers are all blended together, and having them interact consistently from batch to batch does not happen "by accident." All concrete ingredients must comply with American Society for Testing and Materials (ASTM) standards. Concrete aggregates must be of good quality. Mix water quantities must be adjusted based on the moisture contents of the sand and stone. If not, the consequences in the field can be significant. Adding water at the jobsiteSometimes contractors will adjust batches with inconsistent moisture contents (which translate to workability) at the jobsite to make finishing operations as easy as practical. Small variations in concrete moisture are common and typically not objectionable. But modifying mixes in the field, followed by inefficient mixing, can produce a blotchy appearance. Changes in shade become especially noticeable in side-by-side placements, when water is added in the field at the very end of one batch and then the concrete is placed next to earlier non-retempered concrete. Change in cement colorCement delivered to the ready-mix plant may change slightly in color depending on the burning or grinding conditions during cement production. A concrete color change, due to a change in cement color, may be noticeable if a cement substitution takes place during an ongoing placement or this adjusted mix is placed immediately next to concrete produced with cement from a different source. Using cement replacementsTo complicate the color issue, the trend to go "green" and use recycled products as partial cement replacements can produce color variations, depending on the percentage of recycled material put into the mix, the water-to-cementitious materials ratio, and how the concrete is cured. Common recycled or supplemental cementitious materials (SCM) are slag, a byproduct of the steel industry, and fly ash, a byproduct of coal combustion. Using varying quantities of fly ash can result in different hues, ranging from buff to brown. Slag use may produce an initial slight bluish or green tint that lightens with time. Generally, a slag-cement mix will be lighter than a straight-cement concrete. Adding calcium chlorideA frequent reason behind a darkened-concrete appearance is the addition of calcium chloride to accelerate the setting time of concrete (see Photo 1), especially when calcium chloride dosages approach 2% by weight of cement. 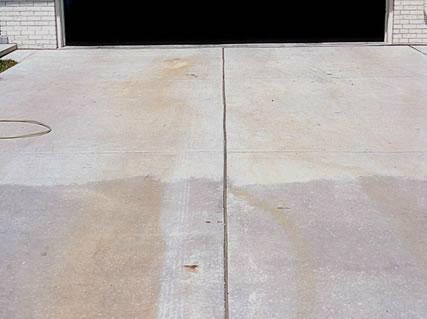 Inadequate mixing after addition of calcium chloride makes the concrete color even more irregular or blotchy. Poor workmanshipHow a contractor reacts to variables during a concrete placement, such as weather conditions that change from morning to afternoon and day to day, can have a big impact on the final results. 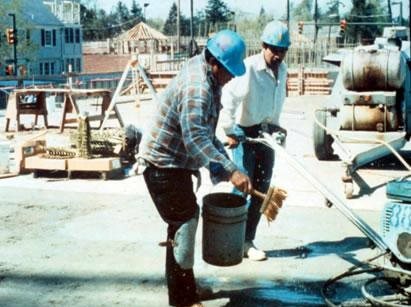 For instance, in a dry environment, wetting down a subgrade prior to a slab placement is good practice. Placed concrete in weather producing higher rates of evaporation may also call for countermeasures such as wind breaks, evaporative retardants or similar practices (for more information, read the American Concrete Institute publication ACI 305R-99, Hot Weather Concreting). Without proper countermeasures, poor practices like "blessing" the surface with additional water (see Photo 2) or final finishing while bleedwater is still on the surface result in increased variability in the surface appearance or, worse, delamination.